Frankly I am unconvinced the topic of who did and did not wear a cuirass in the British or French cavalry service during the Seven Years' War has been adequately researched. We've had a collective hive mind view they did not going back to the late 1960s. This has been based on very little first person evidence or citations. I've had Cecil C. P. Lawsons, A History Of The Uniforms Of The British Army for forty years. When rereading some of it in the spring of 2009, I found this in Volume II on p. 145. 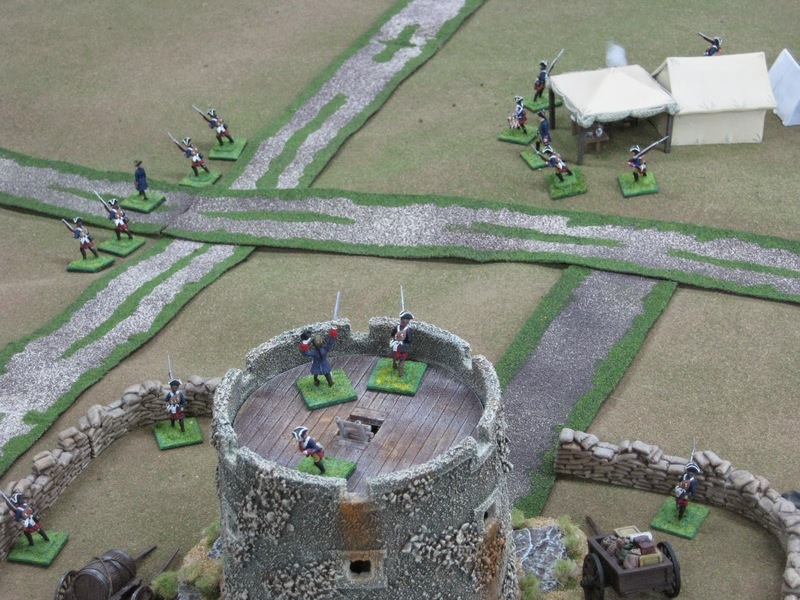 Today (December 29, 2014) while reading Brent Nosworthy's, The Anatomy of Victory Battle Tactics 1689-1763 this appeared on p 132. “Initially, the British cavalry had no body armor, but in 1707 Marlborough gave his cavalry a cuirass in front.” Yes this is fifty years before the Seven Years' War. It is still an eye-opener. Situation: Welcome to Prosperous Germania! BAR is for BIG Battalion and small sized units too. Our annual BAR Light Troop Game is held the first Saturday in December. 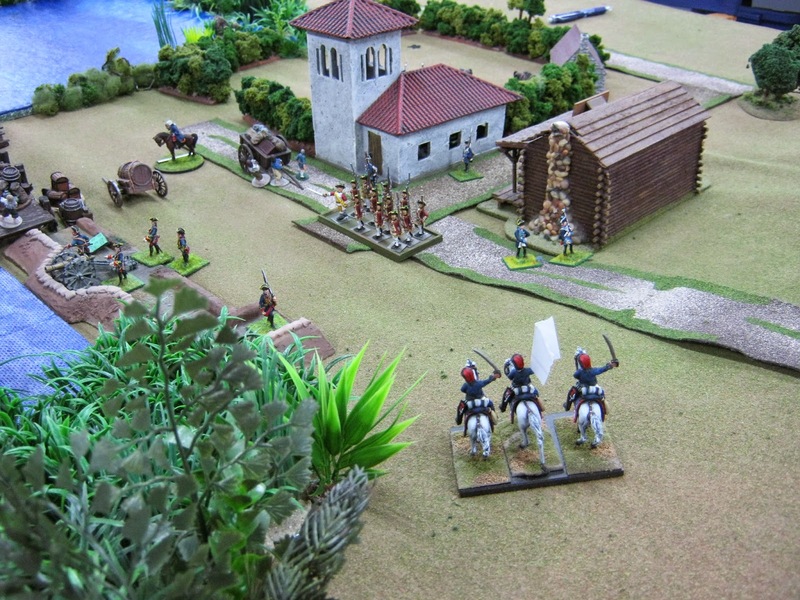 On this occasion each player had mission orders specific to the soldiers under his command. Some were hungry. Others desired to increase the 100 Marks each actually held in small USA coinage; pennies $.01, nickels $.05, dimes $.10 and quarters $.25. One penny equalled one mark. You'll see why in a moment. The following pre-game photos show picturesque environs around the Port of Gildershaven especially for our ten participants and all viewers too. 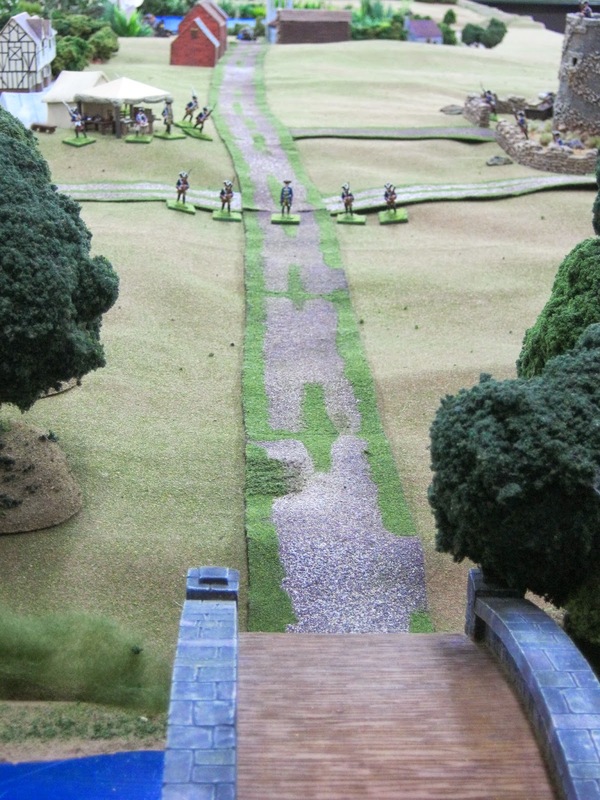 Looking east across a huge Miniature Building Authority Bridge. A little to the east, guards are posted to collect tolls for use of the bridge whether east or westbound. In the far distance is Gildershaven. Guards in the previous photo are off image to the left. Additional guards are posted in the tower. Aerial view of the tower and intersection. The officer there thinks something is approaching the bridge from west (left). However, he is unsure. Perhaps it is nothing. Far to the east of the harbor enclosed fields, animals and homes are at peace. Idyllic isn't it? To the right (south) of the homes you just viewed is the Gildershaven Inn. 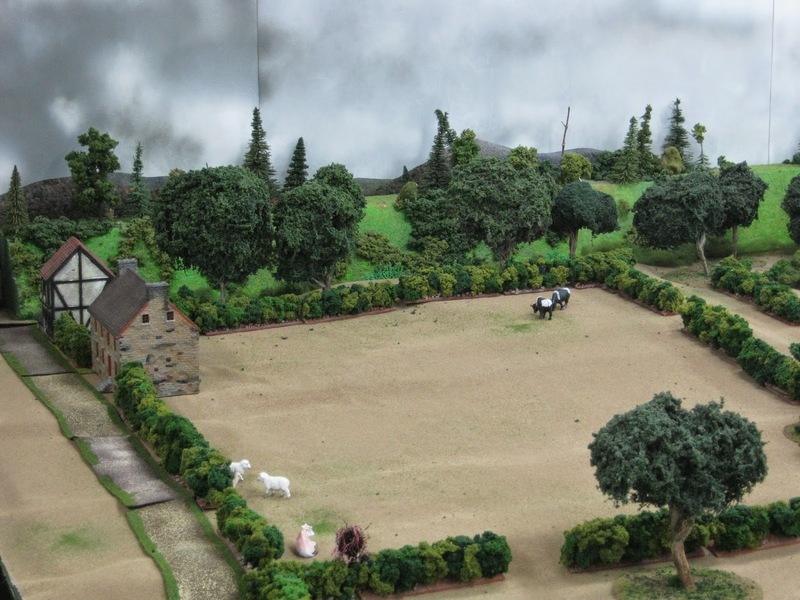 It is from Miniature Building Authority and often appears in our BAR games. 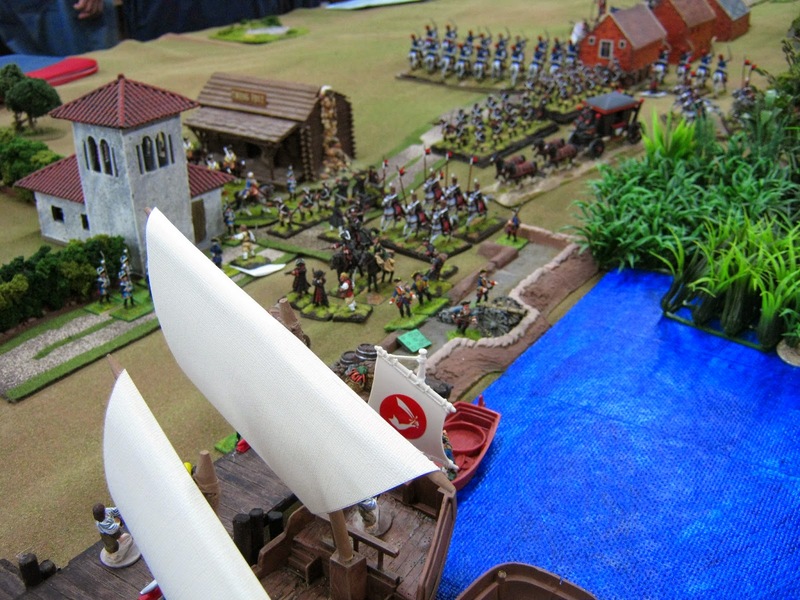 Cossacks began crossing the bridge into Germania from the west. 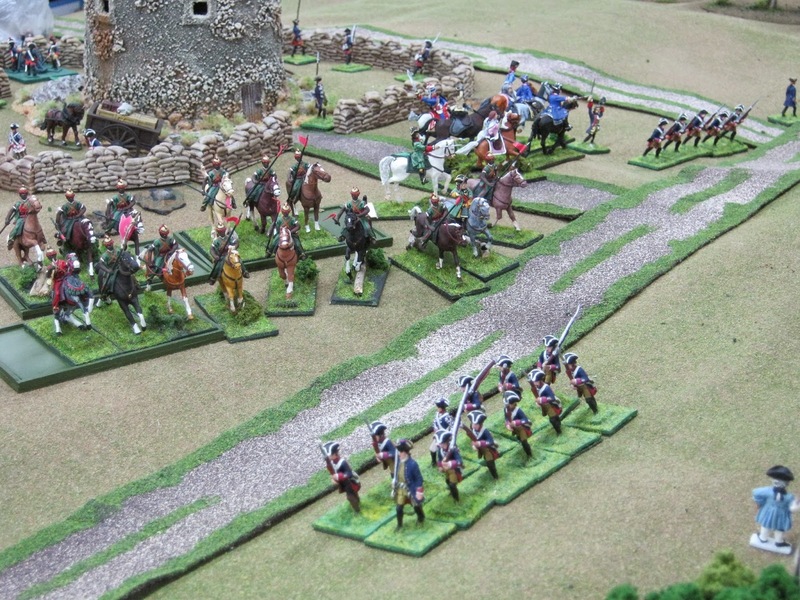 Suspicious of mischief, the original and the relief guards formed up to support one of their officers who halted the riders. He demanded to know their identity, reason for travel in Germania and 1/2 Mark per man. Happily for everyone, the toll was paid. The commanding officer, (Dan W.) was delighted by the 19 Marks collected ($.19 if I recall correctly) not only for The Duke of Germania but also for himself. He felt minimal relief that an incident did not occur. After paying the toll, the Cossacks rode quietly eastwards. Some appeared to be very hungry as they cast eyes left and right. It was difficult to ascertain, but some thought a few Cossacks dismounted to quickly dart behind these buildings to steal geese. Michael had orders to feed all his starving men before 2:00 p.m. real time or lose men that would run off foraging on their own. Fortunately none did. 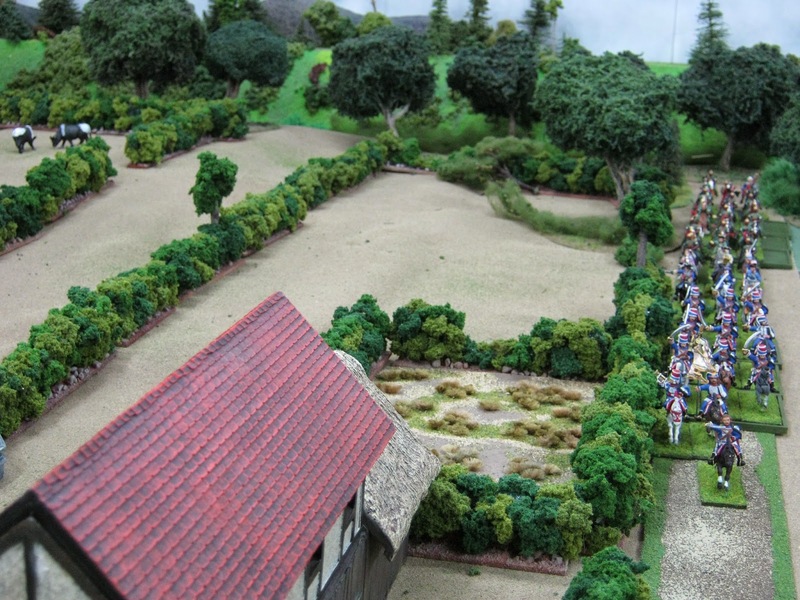 Others thought it odd a band of Cossacks were promenading within Germania so far from home. 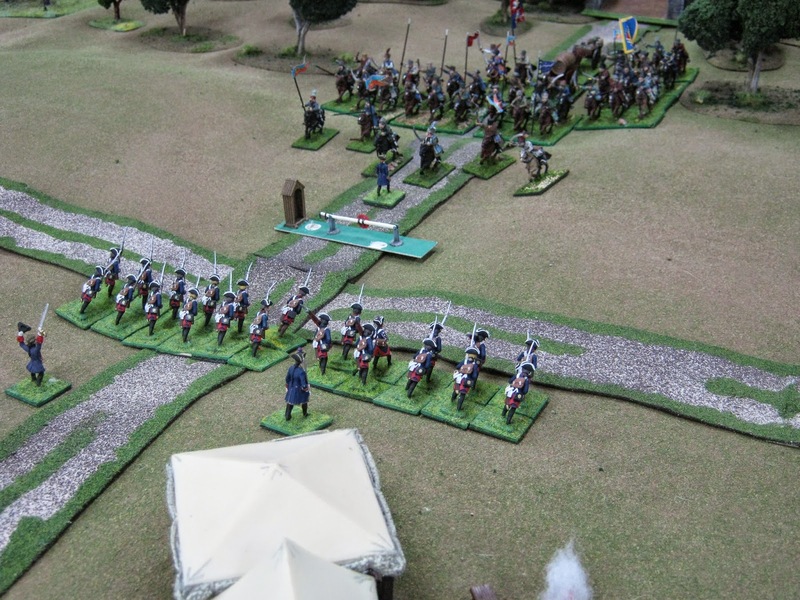 These included a body of Gallian Bercheney Hussars guarding the flank of Lanciers de Saxe. The latter were escorting important female members of the Gallian court. 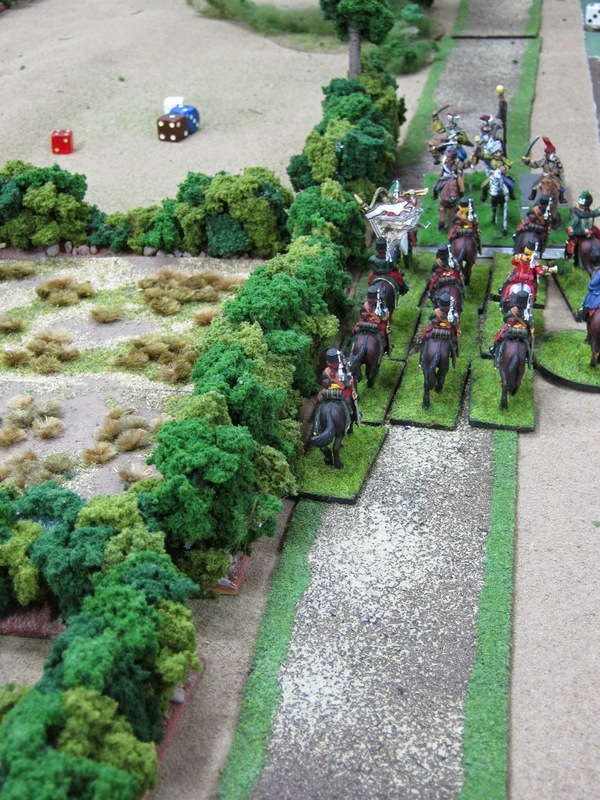 Eventually the Lanciers de Saxe turned to the flank to protect their V.I.P.s. The toll gate guard formed up to assist the party as well. The V.I.P.s were Colonel Enigma, Lady Diana Pettygree to his left on the grey flanked by Lady Belle Silhouette a la Hussar. Following in pink is Lady Cherish Masquerade and a lady's maid. Everyone was in haste to cross the bridge off image to the right. 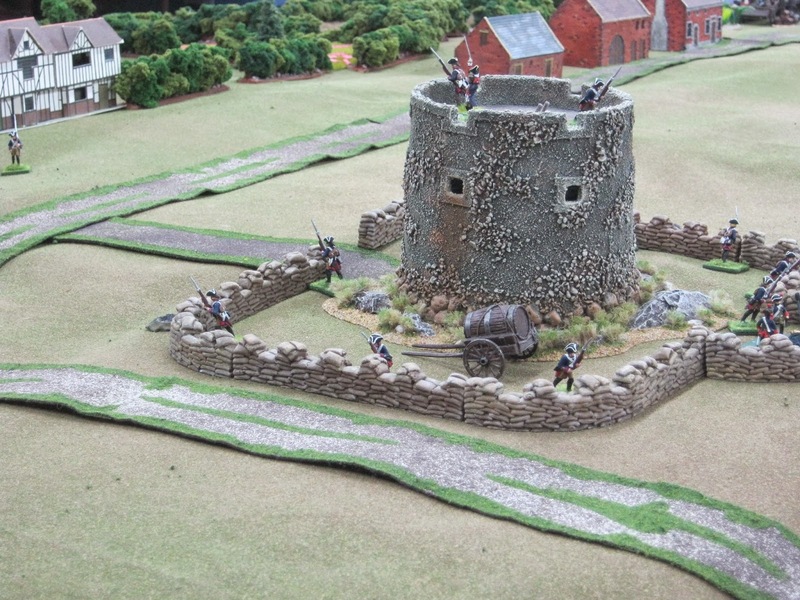 Even the tower and toll gate guards were worried as they followed in the wake of the Cossacks. The Gallians (Curt B.) successfully got the ladies across the bridge with the Lanciers de Saxe galloping behind them. 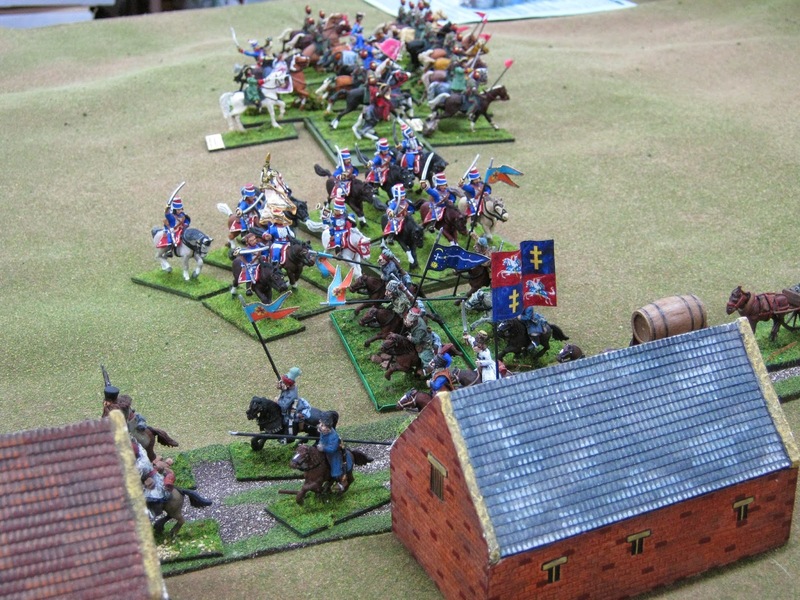 Not shown: the Cossacks turned about to attack the Bercheney Hussars who died almost to a man protecting the Gallian courtiers escape. 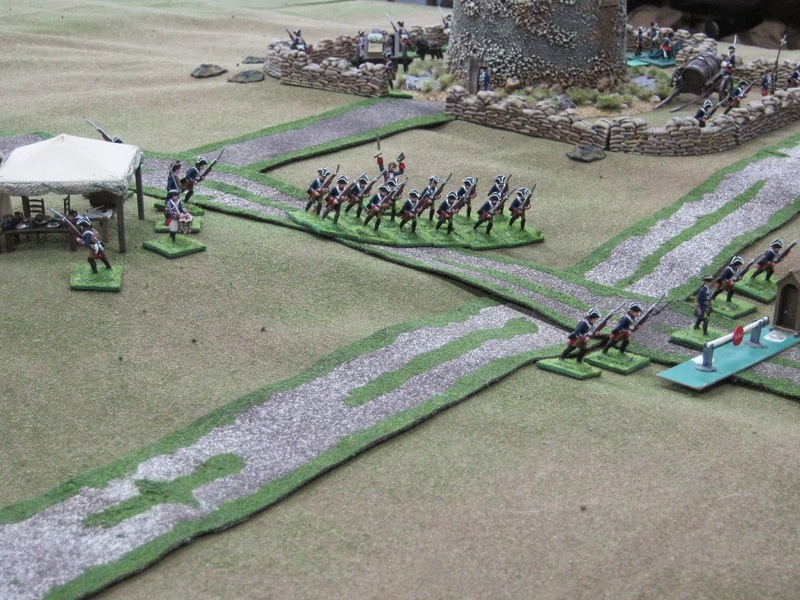 In so doing the Cossacks looted each Bercheney casualty. Michael and Curt threw D6s versus each other. If Michael won, he looted one mark ($.01) from the casualty. Sometime later the Cossacks reversed course and galloped over the bridge to escape a vortex of trouble that began swirling about them. The Duke of Germania, (Chris K.) The surprised Duke stopped the Cossacks demanding to know the reason for their appearance within his domain. Sufficient reasons were offered and marks were paid to the Duke. Then each body went on their way. However, things went wrong. These Cossacks were starving similarly to their brothers miles away to the west. 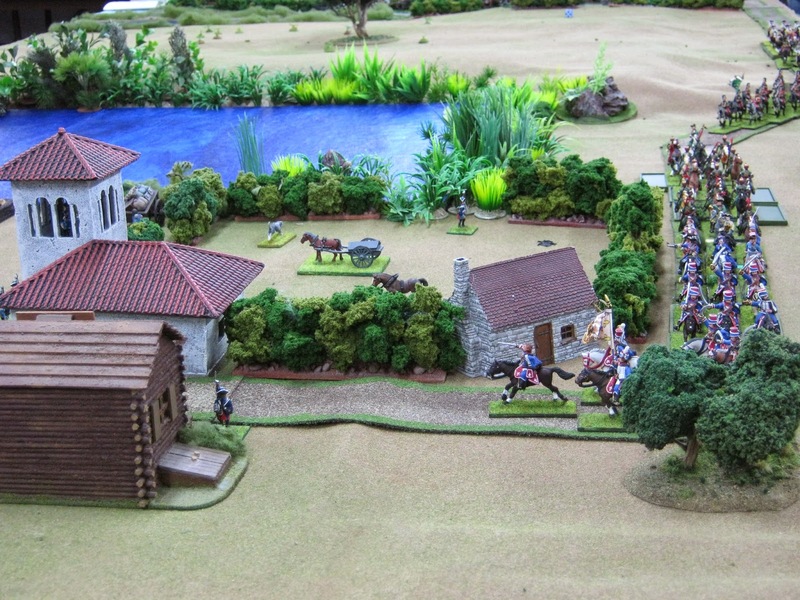 Once the Duke was out of sight, the Cossacks plundered the Inn. Three D6s were thrown for marks. Another three D6s were thrown for food. Unknown to the Cossacks and The Duke, a body of Germanian Light Horsemen had been shadowing the former raiders. Their mission (Keith L.) was to pursue and attack the Cossacks. 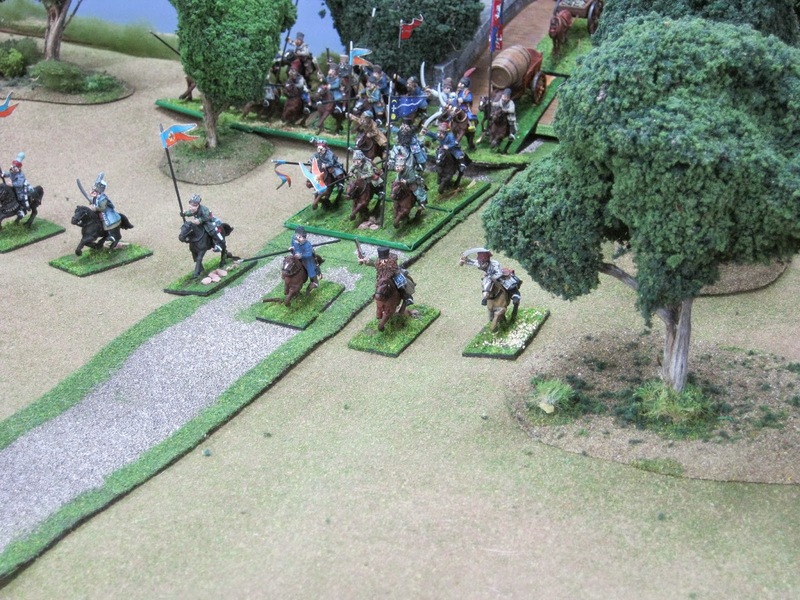 When it became apparent the Cossacks were looting the Inn, the Germanian Light cavalry dismounted and moved forward. Learning about and hearing the mayhem, The Duke returned with his own light horsemen, dismounted them and began a close investment. 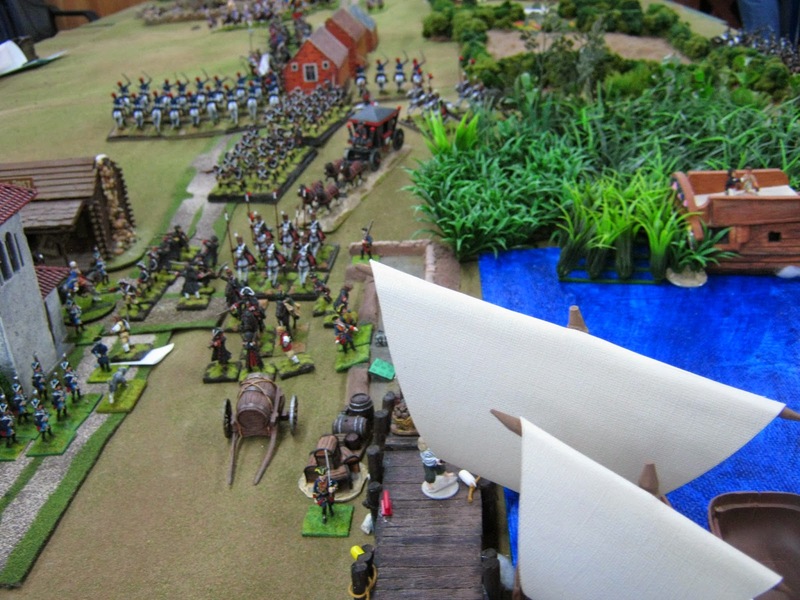 This was too much for the Cossacks. 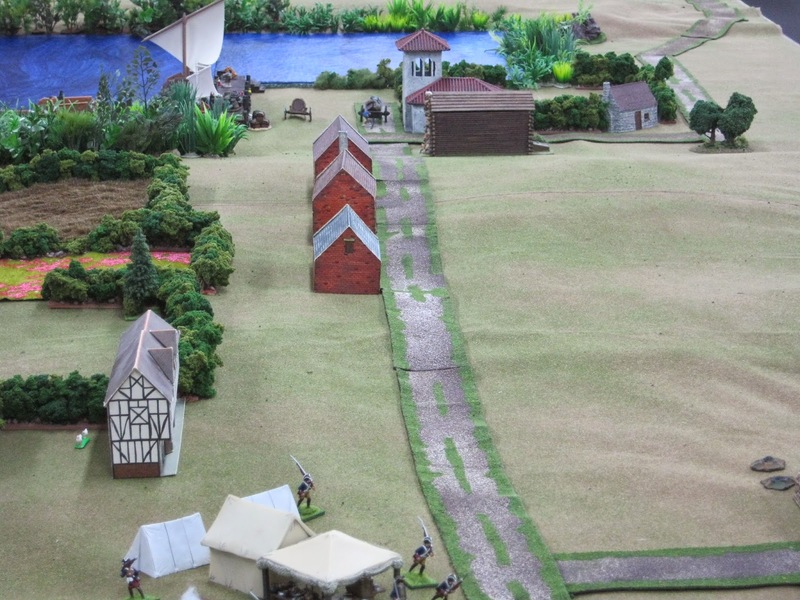 Several parties mounted up behind the Inn moving on diverse courses to flee. 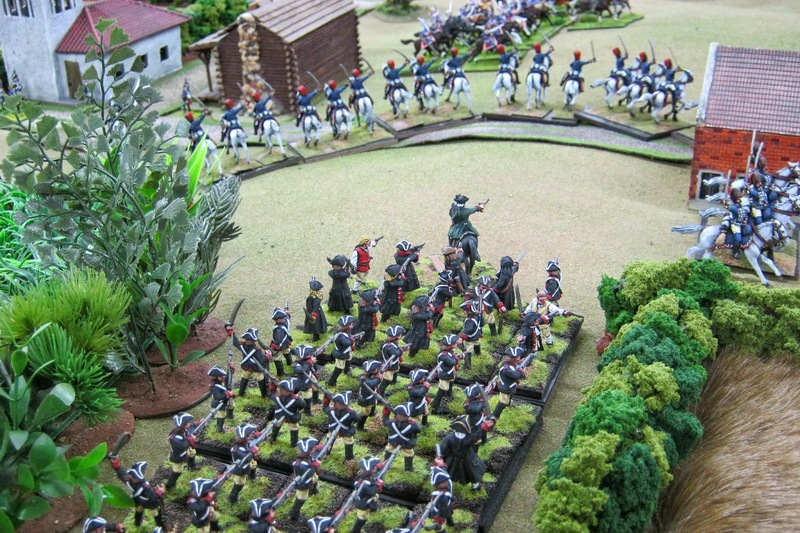 One body (above) was caught by some of the Dukes Chasseurs a Cheval and cut down. Another party was cut down by Keith L's men. 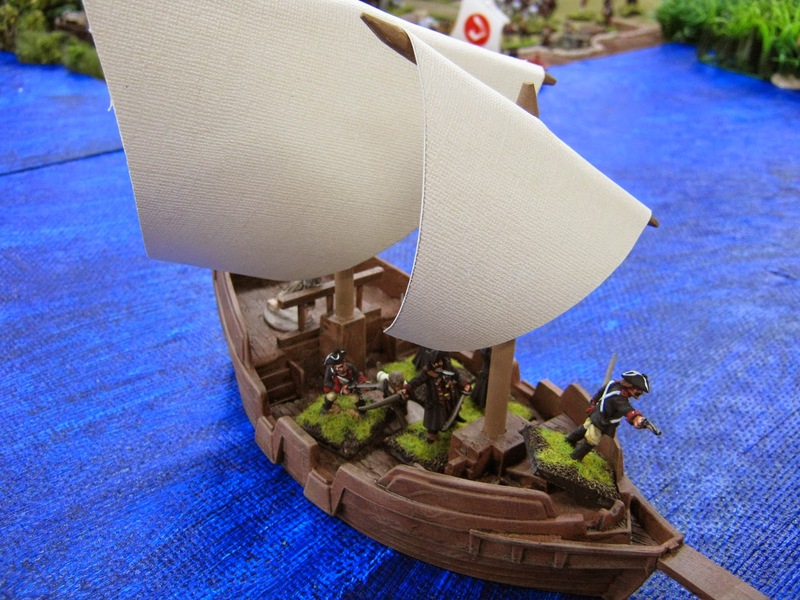 The raiders were unable to find an exit out of an enclosed field. 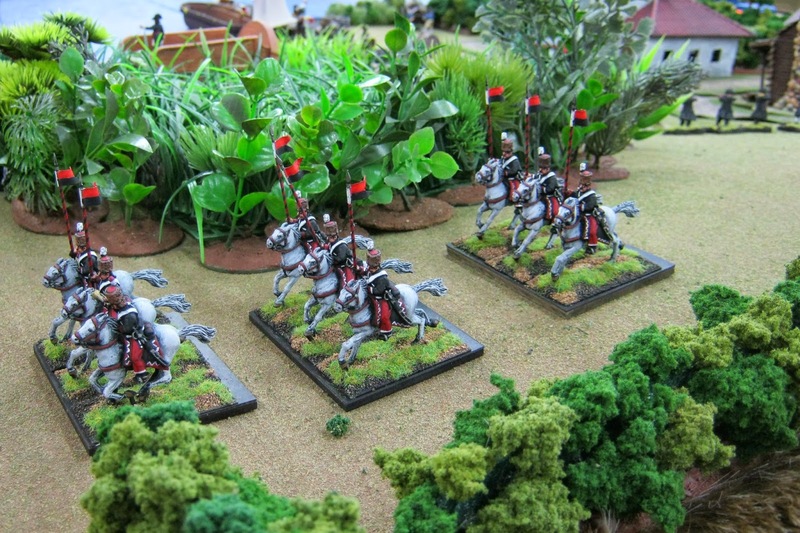 The celebrated Bosnian Lancers took no prisoners. We see the same party of Gallians arriving at The Port of Gildershaven. 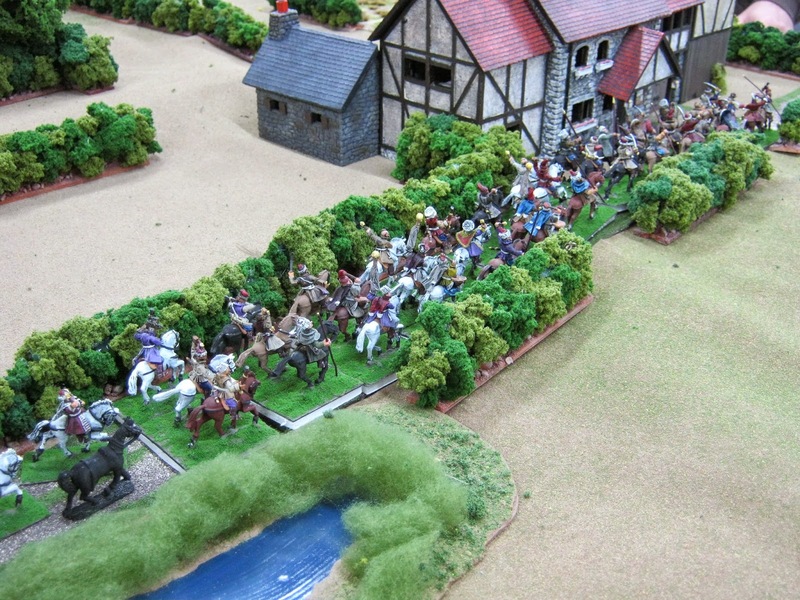 In the upper right of the image are The Duke's Chasseurs A Cheval before these turned about to attack the Cossacks then looting the Inn. The dock and supporting buildings at the Port of Gildershaven. Harbormaster (John B.) 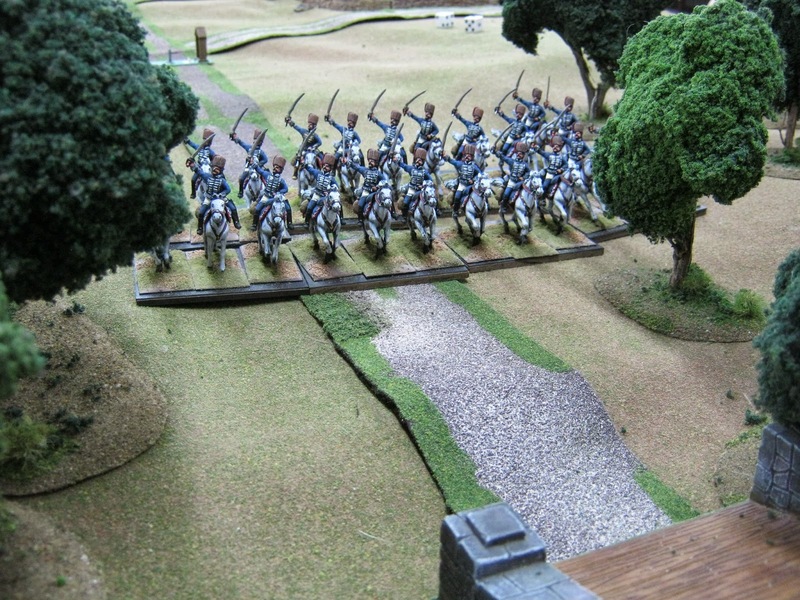 stands beside the log building with a guard as riders come in under a parlay flag. 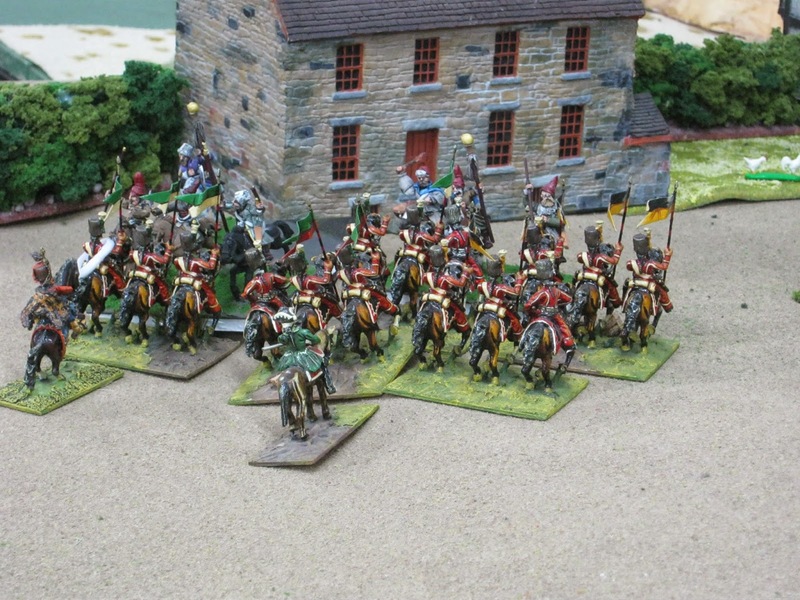 Their troop of Hussars wait a little distance away. 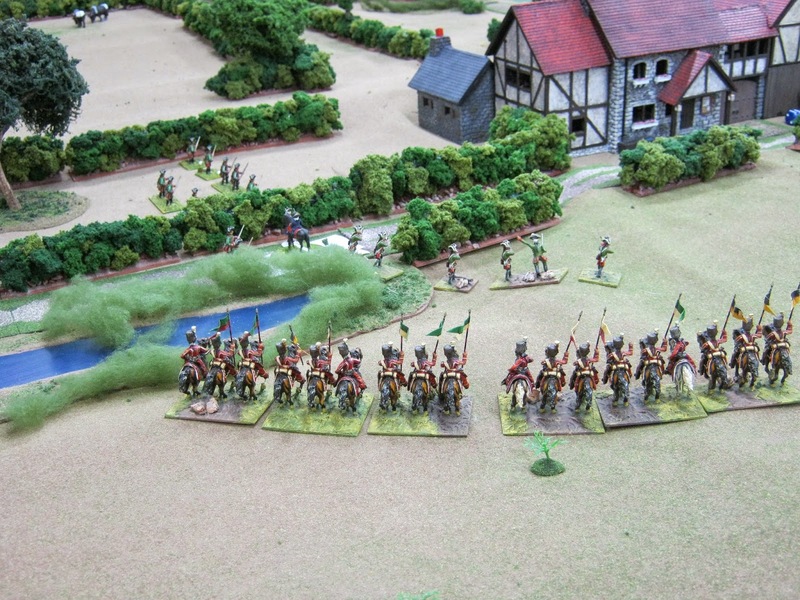 Then the Hussars fan out. This caused the Gallians to leave the road and head overland to the west for adventures described at the beginning of this narrative. 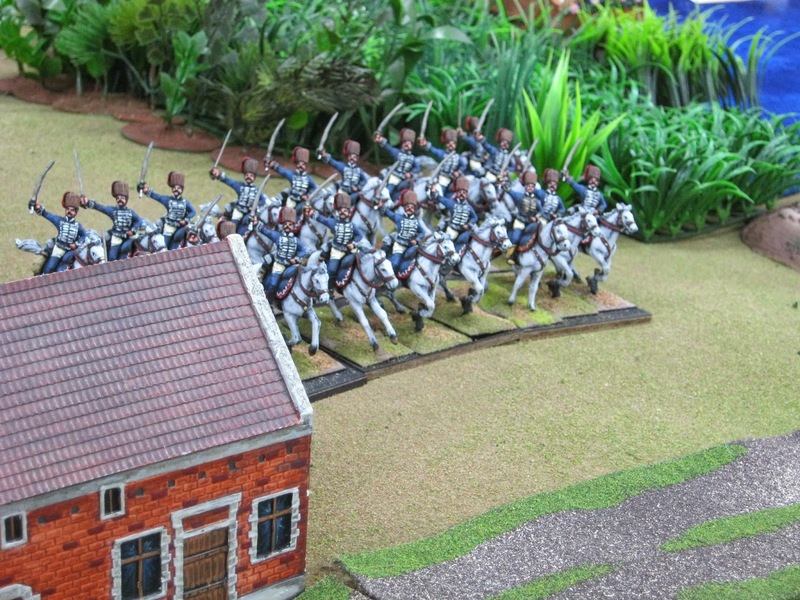 Black coated infantry follow the Hussars. Who are they? The mysterious body spread out around the port as a black and red coach maneuvers to the dock. To the eastern bridge far away. These were all from the collection of Der Alte Fritz, Jim P. who with Earl K. commanded them all. To no doubt distress Germanians at the abandoned Toll Gate. 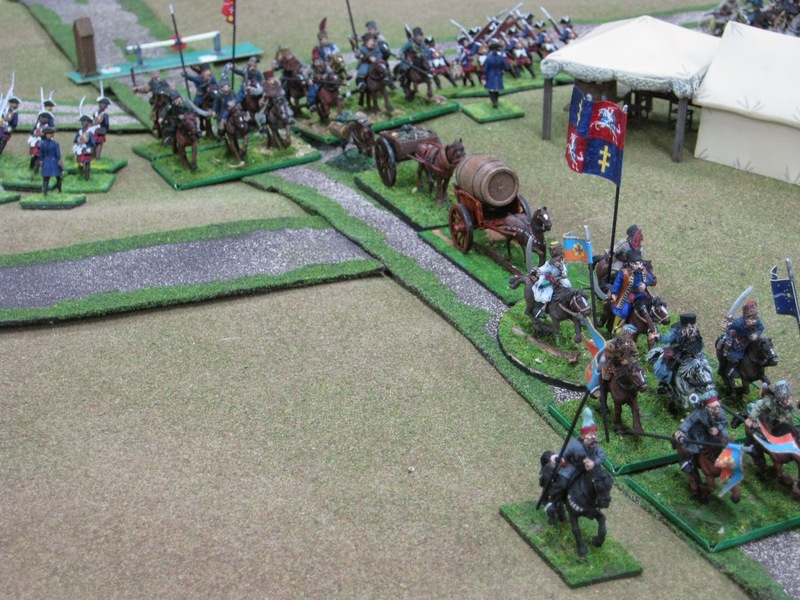 The Hussars are in the upper right of the image supported by a rough looking group of Black Hussars. None of this mysterious force fired a shot. We surmise their mission was to get the disguised woman out of the area. Her identity remains a mystery. (1) Everyone was present for duty by 10:00 a.m. Chris K. brought a bottle of wine to share. I took the occasion to toast ourselves as a very companionable group and stated how much I appreciated all of them and for all they've contributed over the years. 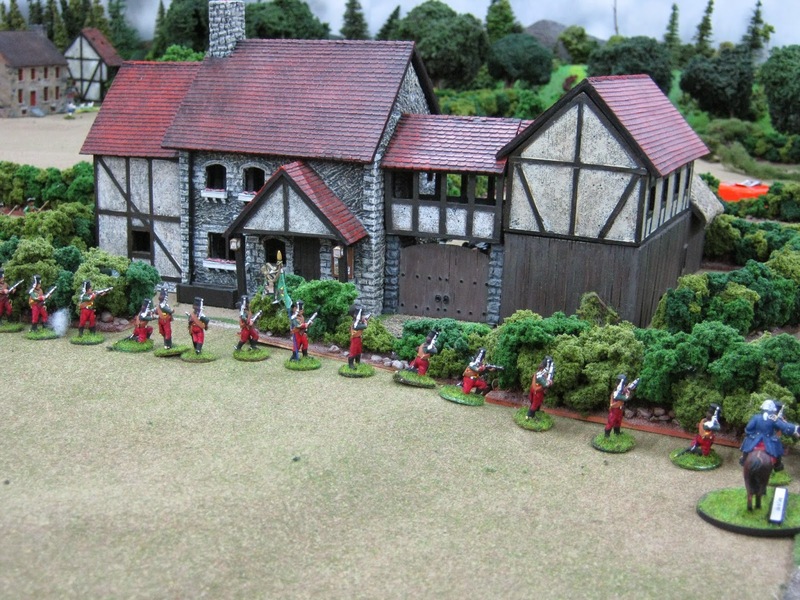 A second toast was offered for the celebrated miniatures designer and entrepreneur, the late Peter Gilder, for his classic miniatures, personal style and indeed his teaching about the marketing of selling toy soldiers to one member present. (2) Written orders and various other important details were distributed to each player. No one knew anything other than what was then on the table and within their orders. Fog of War was essential. (3) Movement was by card draw. Five sets of four cards each were assembled and shuffled multiple times. Each set had one Heart, Diamond, Club and Spade. 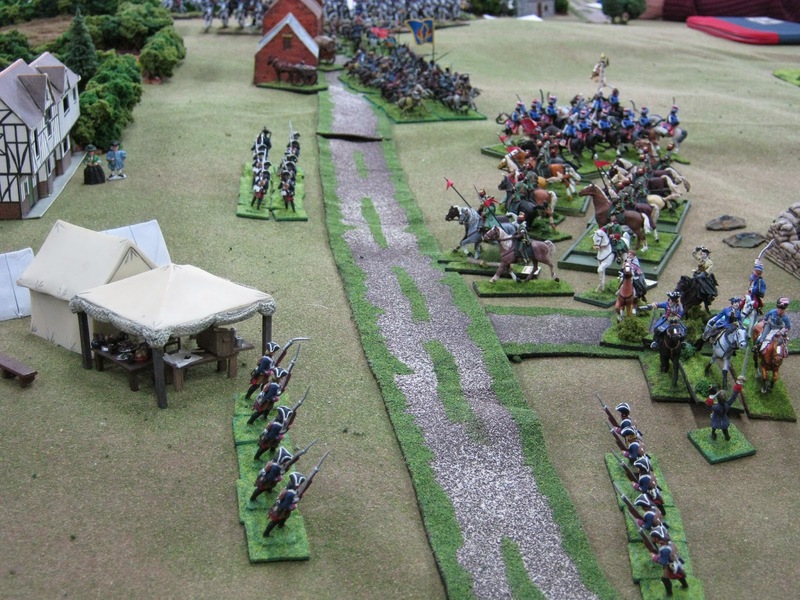 Cossacks and the mysterious black uniformed brigade moved on a Club or Spade. Germanians moved only on a Diamond. Lady Pettygree and the Umpire activated on either a Heart or Diamond. This is not routine for BAR but it worked to give flexibility to those who most needed it. (4) Cards were not used for Fire. Instead, players threw a D6 versus each other. The winner fired first; the loser second. A tie caused simultaneous fire. This is also not routine for BAR. I instituted it to make turns go faster. (5) Also to help turns move faster, a kitchen timer was used. 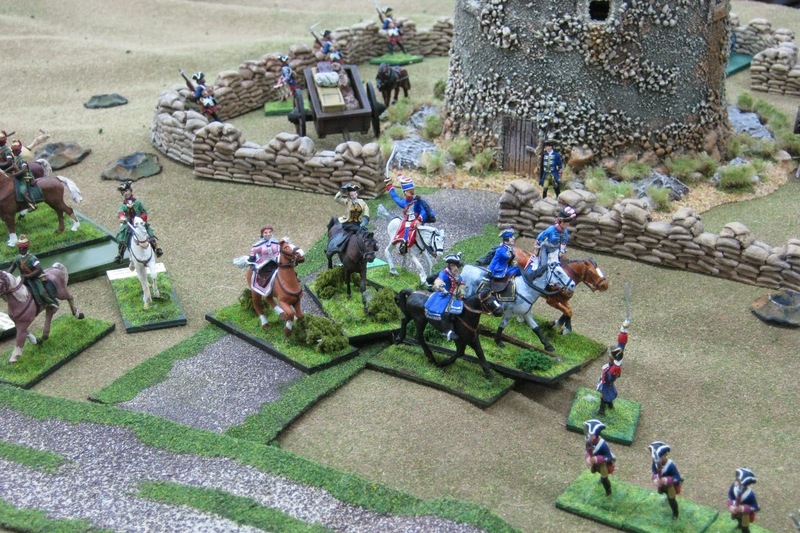 If someone was not finished at the end of five minutes, unmoved miniatures were frozen. It happened only once. (6) The game started at 10:40 a.m. and concluded around 3:00 p.m. including a break for lunch. My wife brought down a sandwich tray, cole slaw and to this was added other scrumptious items brought by participants. Thank you everyone! (7) Miniatures to real men ratio: 1:1. (8) Who won? Everyone! How? Every participant achieved individual mission goals. Those who profited the most were The Duke and Toll Gate Commander. 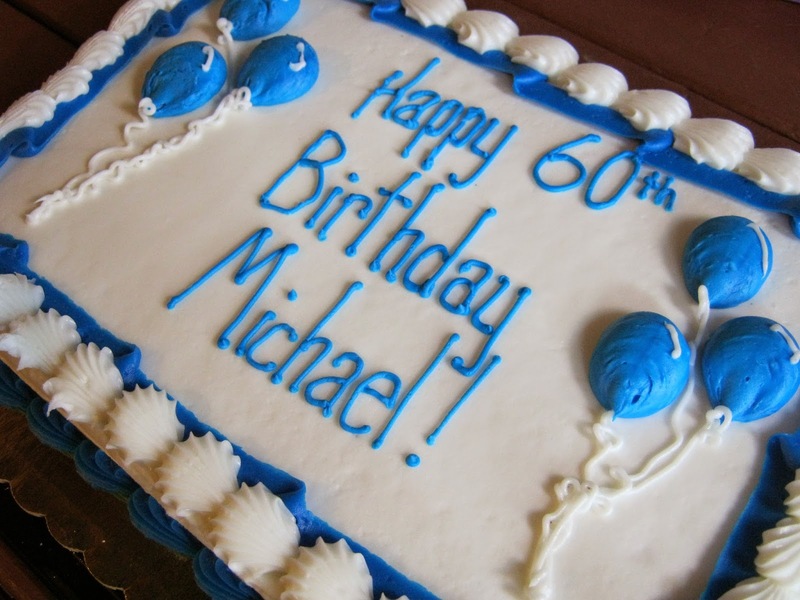 (9) After the game we feasted on a delicious birthday cake to celebrate Michael's imminent birthday. (10) Chuck and Todd unfortunately could not be present. However, they received compliments through me about vegetation placed around the harbor. It all came from aquarium departments in pet stores. 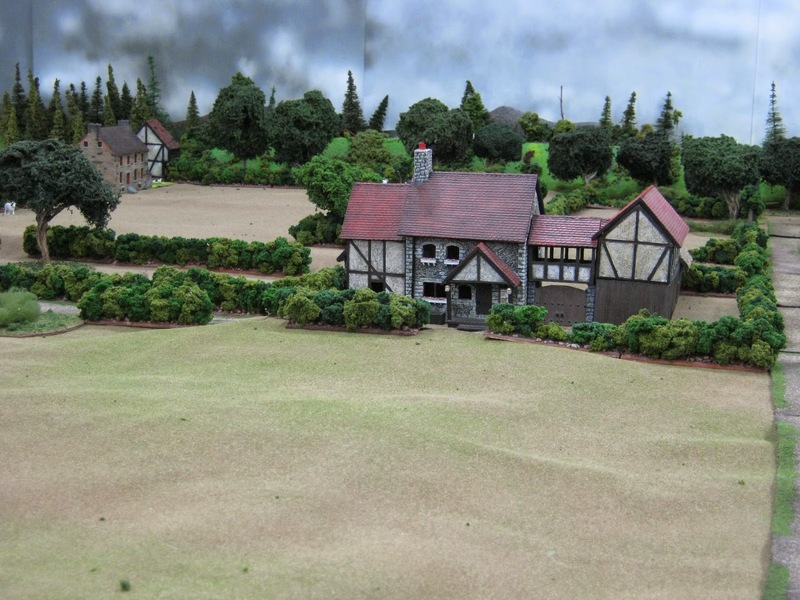 Hedges were from Chuck's collection of scratch-built Normandy bocage. (11) The harbor was made as follows. The top of 1/2" thick Homasote fiber boards was painted with a very thick house white primer paint. Really thick. After drying, Liquitex Professional Acrylic Artist Color, Soft Body, Phthalocyanine Blue (Green Shade) was spread on top. I worked at it to so it appeared shallow and deep in various places. White showing through gives the illusion of a sandy bottom. The whiter it is the shallower it appears. 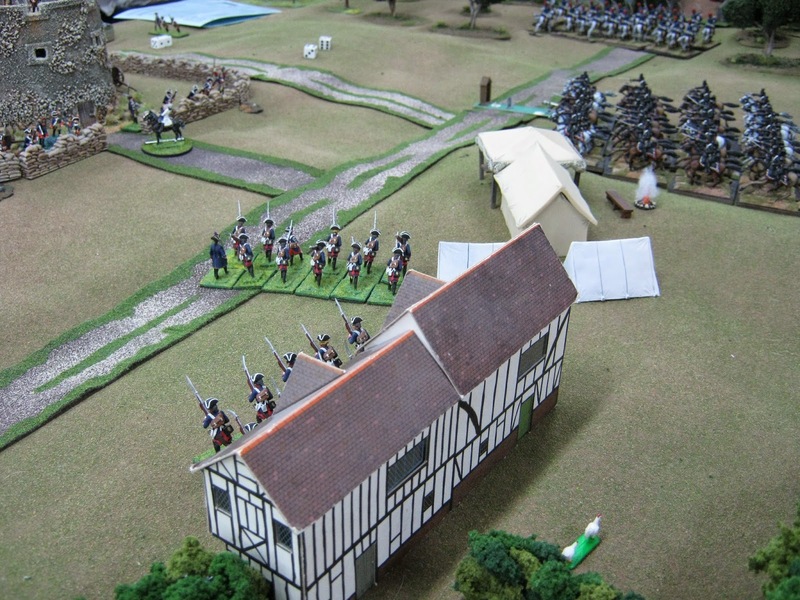 (12) Not very many shots or hand to hand combats occurred. 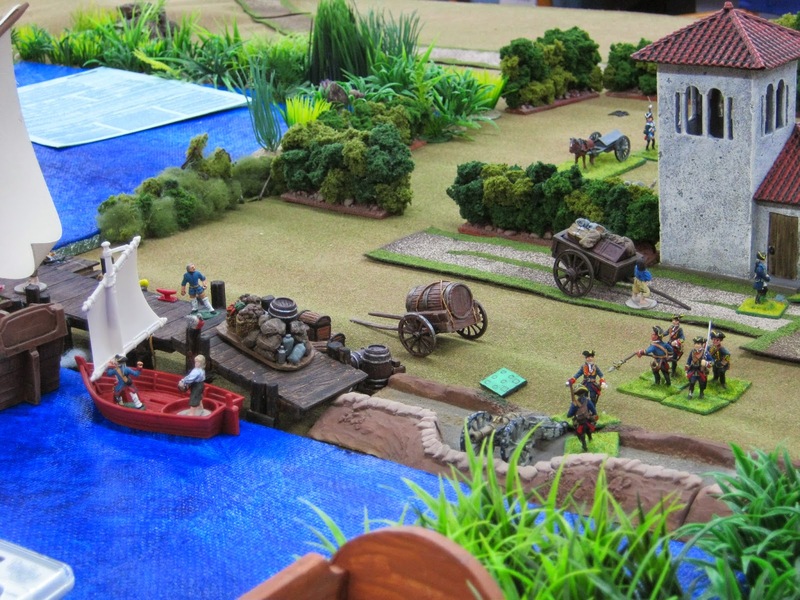 Players were busy trying to avoid conflict while adding to their wealth, avoiding starvation or trying to get away. There was constant negotiation. Afterwards someone said it was more like a role playing game. 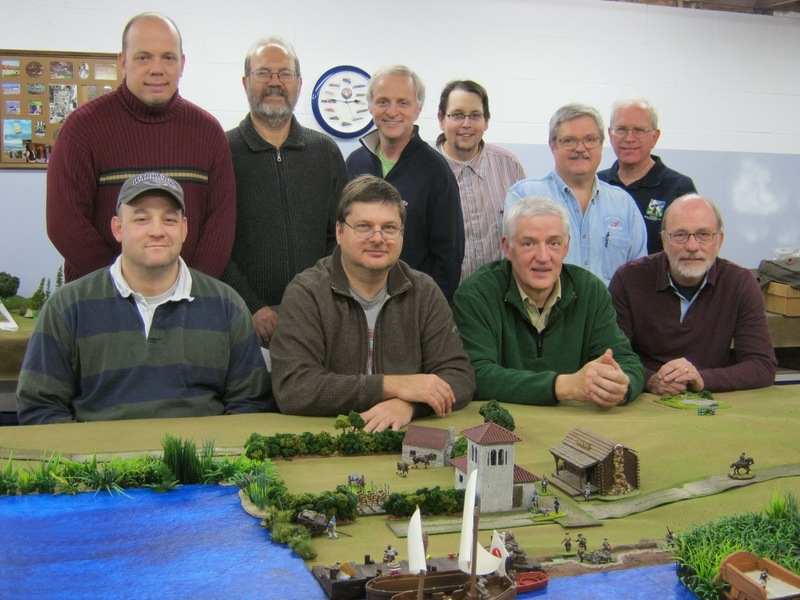 Seated left to right: Harbormaster John B., Gallian Troupe Curt B., Germanian Light Cavalry Keith L. and Black Legion Earl K.
Standing left to right: The Duke of Germania Chris K., Eastern Area Cossacks John M., Black Legion Jim P., Tower & Toll Gate Commander Dan W., Western Area Cossacks Michael M. and yours truly the Umpire Bill P.
(14) Participants and readers are very welcome to post remarks below at Comments. Same will appear after review due to an unwelcome spammer. However, I check the site daily so the wait won't be long.